The secret to growing a great looking beard is caring for your facial skin and hair. When cared for with good nutrition and grooming habits, beards tend to grow fuller, faster, and longer. Most men who realize this start using beard care products regularly to get that manly look. From beard oil and balm, to beard balm, wax, and shampoo, there is no shortage of beard products to use. The wide range of choices that are available, however, can make your decision making process slightly difficult. If you’ve chosen to grow a beard and don’t know what products to use, consider Mod Cabin’s Beard Oil and Backwoods Beard Balm. It’s a highly sought after product, and with good reason. So, why should you go for this particular beard balm and oil? Will you get your money’s worth? This review will delve deeper into Mod Cabin’s beard oil and balm to help you find answers to these questions and know what to expect should you choose to make a purchase. First, let’s have a look at the features that this beard care product set comes has to offer. Mod Cabin’s Backwoods beard balm and oil is exactly what it says it is. You’ll get beard oil and balm to help you nourish and style your facial hair. The beard balm is an excellent addition to any grooming toolkit since it makes managing beards easier. Rubbing just a pea size amount on the face leaves your wild mane feeling soft and thick while at the same time helping you to tame those unruly whiskers. On the other hand, Mod Cabins beard oil is enriched with essential oils that penetrate and moisturize hair follicles. A daily dab of this oil not only promotes healthy beard growth but also soothes itchiness when growing a previously trimmed beard. 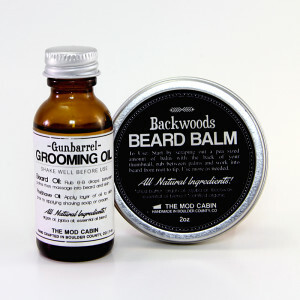 Like other Mod Cabin beard care products, this balm and oil is made from all natural ingredients. That means no synthetic dyes, fragrances, parabens, or chemical preservatives have been used in the formulation. The balm comprises of shea butter, beeswax and a unique essential oil blend, while jojoba and argan oils are the main ingredients used in the product. As a result, you don’t have to worry about skin sensitivity, neurotoxicity, or other harmful side effects caused by filler ingredients found in other conventional beard care products. For men who want more from beard care products, Mob Cabin’s Beard Oil and Balm might be for them. An added bonus that comes with this set is the nice smelling essential oils. The Backwoods balm is lightly scented with pure cedarwood, fir, and vetiver essential oils. Alternatively, you can also opt to go with the unscented version. There are three scent choices to choose from when purchasing your Mob Cabin Beard Oil. Scent options include the Wanderlust, Vagabond, Gunbarrel, Miner’s Mint, and Ridge Runner beard oils. Formulations consist of jojoba and argan oils along with a blend of other essential oils that gives each scent its own personality. Mob Cabin handcrafts their beard oil and backwoods balm in small batches to maintain quality and consistency, and such a small packaging really offers a lot. For starters, it’s convenient to carry your beard oil in a small 30ml/1oz glass vial and balm inside a 2oz screw top tin when traveling. The packaging is also quite economical because a little oil and balm can go a long way. Heat sensitive balm melts in your palms for easy application. 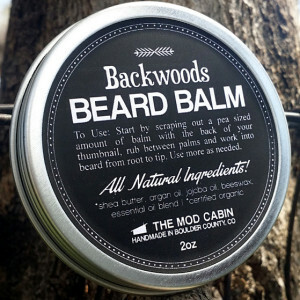 Mod Cabin’s Backwoods Beard Balm and Beard Oil offers many benefits that make the purchase worth it. Overall, this is an excellent beard care product combo set since it does as it claims. The best part is that you now have an affordable way to not only nourish and style your beard, but also keep it moisturized throughout the day.